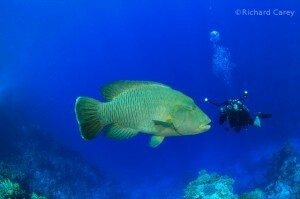 I was lucky that Rich was with his camera on this dive and I’m in the picture with this massive Napoleon Wrasse. This picture is something special to me because normally I do not appear in the pictures as I’m on the other side of the camera. Thanks a lot to Richard Carey for sending this awesome picture to me. Dive was on Anemone City in the national park Ras Mohammed near Sharm El Sheikh in Egypt.